While it sounds unusual, a liverwurst, shallot and mustard sandwich is an amazingly complex combination of flavor that transforms into something beyond its parts. Kumato and Garlic Spread, on the other hand, is an example of how something simple can still be elevated. Add 45c for butter and garlic spread on both. A great pair of sandwiches for $2.12 per serve. 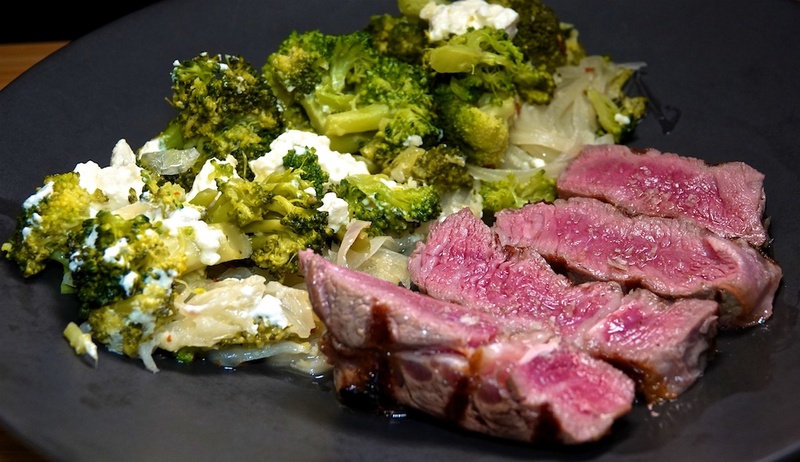 The last of our Keller Crafted steaks (and sadly because we’re flying out on what would have been delivery day, the last for the next month) went on the grill and was paired with an old favorite: long cooked broccoli with onion and feta. The broccoli is completely transformed by the long cook, into something that melts away in your mouth and has great flavor from the onion and feta. The dish makes four serves. Add 15c per serve for red pepper flakes and other spices. A very filling and satisfying meal for $8.06 per serve. A smoked tuna pouch went into a melt with capers and Swiss cheese. The second sandwich was turkey breast, moon touched tomatoes and Swiss. Toasted and shared for a little variety in the meal. A couple of good sandwiches for $3.01 per serve. Tonight was our monthly LACPUG meeting with pizza afterward where we all contribute $10 each. Today we finished off the shredded beef in a rustic panini roll we finished in the oven. Drizzled with the juices and topped with a little crisp pickled onion, it’s nearly a perfect roll. An exploration into a new recipe – Gnocchi skillet with bratwurst & tomatoes, although we used Trader Joe’s Bavarian Bratwurst instead of chicken sausage. We also used cauliflower gnocchi instead of pasta and used shaved parmesan instead of basil, because we don’t like basil! Every new recipe you hope to find another winner, or a new favorite, but this time we got an okay meal for $4.91 that we probably won’t repeat. Without clear lunch plans and one ‘ready to go’ avocado, we split the avocado across two sandwiches, added a pouch of sweet and spicy tuna and a generous spread of Trader Joe’s garlic spread to create a really good sandwich. A good sandwich for $2.07 per serve. In the spirit of meatless Monday, we grilled mushrooms to perfection and served with a Onion, Blue Cheese and Cream sauce along side steamed asparagus. Asparagus was $3.69 or $1.85 per serve. Mushrooms make a great meat alternative and complement the sauce beautifully. 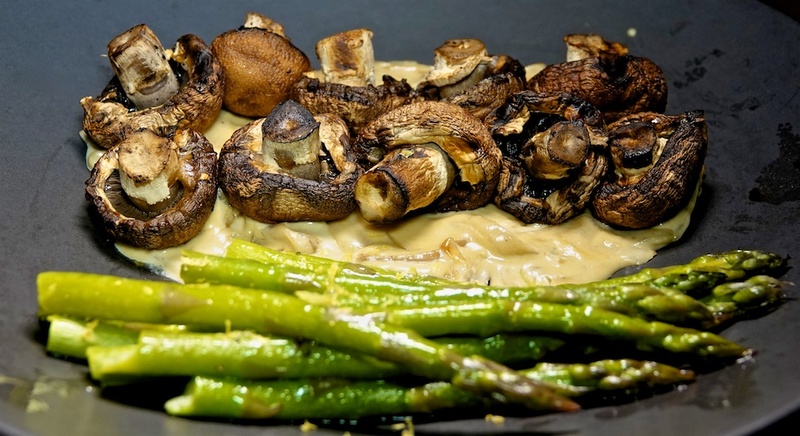 The asparagus with lemon provides a nice acid counterbalance to the richness of the cream sauce. A great meal for $5.08 per serve. Today we soft scrambled pastured eggs. While that was happening we fried off toast in the panini press and covered with smoked salmonella on. The egg went on top with a generous shrinking of Trader Joe’s ‘Everything but the Bagel’ seasoning. Add 25c for butter and seasoning. Lunch today was a perfect balance of crunch from the toast, salt and smoke from the smoked salmon with the soft scrambled eggs providing an amazing mouth feel, for $4.91 per serve. We decided to make a meatloaf using the same recipe as for the Soutzoukakia but without the sauce. This is now one of our two favorite meatloaf recipes (the other being Turkey, Bacon Chipotle). 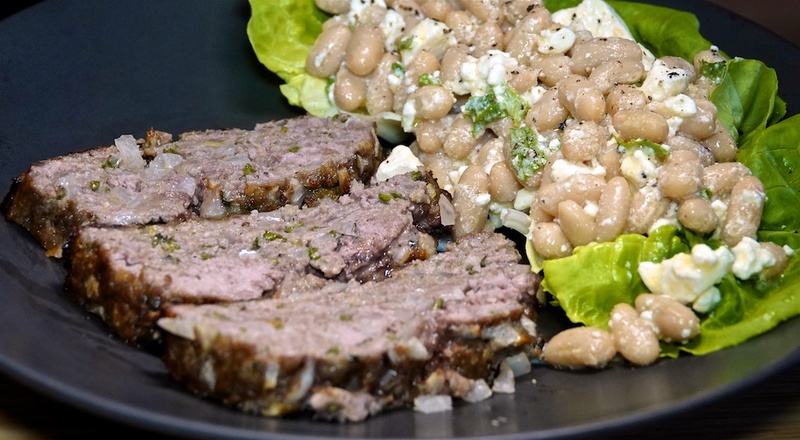 Served with a moderately interesting salad of White Beans, Feta, Mint and a generous amount of lemon, it was a good complement to the meatloaf. Parmesan cost $5.75 but we used about 1/8 for this dish, or 35c per serve. Add 30c for lemon juice. The white bean salad was good, but suffered from being a bean salad! Still, it worked well with the meatloaf, which we finished completely! A great meal for $6.92 per serve. Today we had our favorite sandwich: a pork Bahn Mi for $8.75 per serve. The recipe makes four serves. 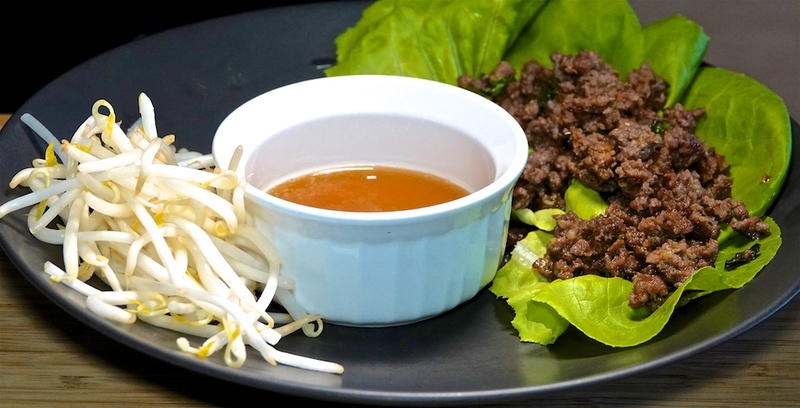 Foodie Philip had seconds with the beef larb directly over the bean sprouts drizzled with the Nam Prik Nam Pla dipping sauce. Add 30c for dipping sauce ingredients. Because the lettuce wasn’t “cupped” it wasn’t as successful as a wrap as we would have liked as the meat tended to fall out during dipping! Still, good flavor and great balance between savory, salty and sour for $4.00 per serve. The Foodies were near The Country Deli around lunch time, so why not drop in! Foodie Philip had his usual marinated skirt steak (rare), with home fries and eggs over easy. Foodie Greg broke with his pastrami tradition to indulge in an enormous rare roast beef sandwich with steak fries. The Country Deli was $22.35 average per serve with tax and tip. After such a big lunch we went light for the evening meal. 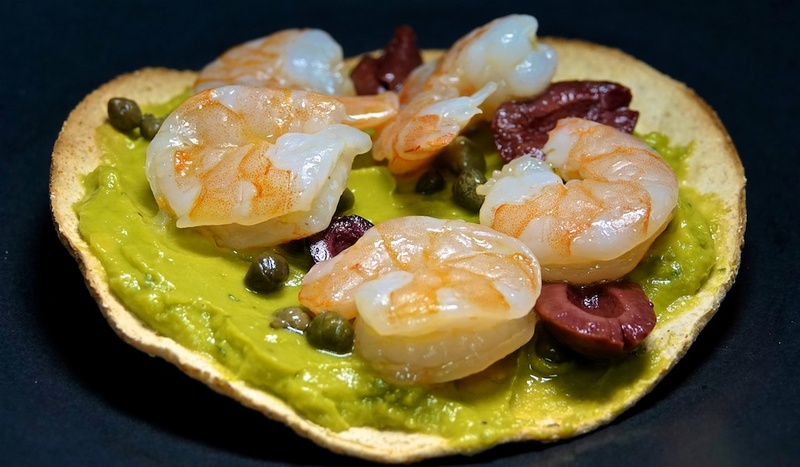 We layered up guacamole, capers and black olives on a baked tostada and topped with sous vide shrimp, which were perfect. While in some recipes, we found the black olives to not work with the other ingredients, so we removed them. The tostada probably needed a squeeze of lime juice to liven it up, but overall was pretty good (without the olives). Add 20c per serve for oil and seasoning used to sous vide the shrimp. A surprisingly filling meal – although Foodie Philip did have two – for an average of $2.91 per serve. We had an heirloom tomato remaining, but sadly – as is the way with real food – it was already deteriorating four days after purchase and we only got one sandwich from it. We paired the chicken breast with moon touched tomatoes. Both had roast garlic spread instead of mayo and we feel the garlic and lemon overtone elevated the sandwich. It was hard to tell the difference in flavor between the fresh heirloom tomato and the enhanced flavor from partially drying tomatoes via the ‘moon touched’ method. Certainly the latter is more available and longer lasting. Two good sandwiches for $1.84 per serve. 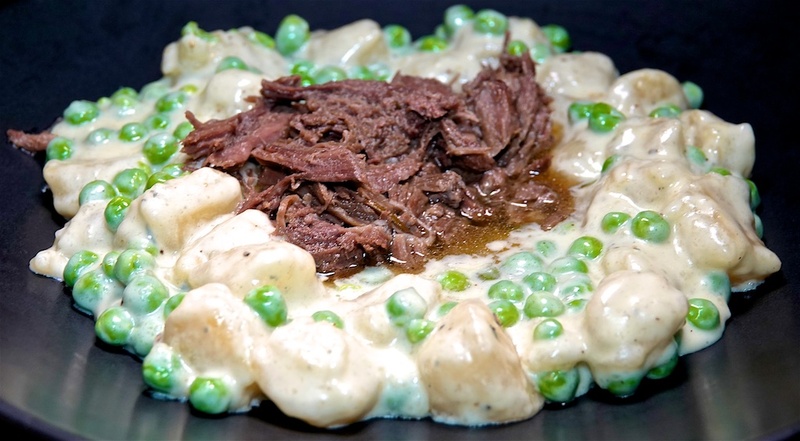 We used another serve each of the shredded beef and served with cauliflower gnocchi in a blue cheese sauce. Add 30c for other ingredients. The juices off the beef were perfect with the gnocchi, creating a sauce that was more than either the beef or the blue cheese. A good meal for $7.23 per serve. Our local land development company again hosted Urban Espresso for the local community. We both had decent coffee and a bacon, egg and cheese brioche bun with a side of fruit. We opted for a simple meal using up the legs from our Jon’s chicken, which we served with black rice and yellow lentil dahl. The dahl was $1.99 or $1.00 per serve. A decent meal for $3.19 per serve. As we had ripe avocados we had to use them! So we paired one mini avocado with a smoked tuna pouch and another with smoked turkey breast and sun dried tomato. Two good sandwiches for $3.53 per serve. Out celebrating a friend’s birthday we shared a Pad Thai from Burbank Wocano, which was pretty good. Not necessarily traditional, but good for $11.63 per serve.